11Sheep’s The Office Quest is a brilliant indie that takes a good long look at office culture, scratches its chin, then lets out a long, low chuckle. It doesn’t hesitate to play on common tropes of cubicle life, and complements its excellent sense of humor with a unique muted art style that has its characters in animal-esque onesies. It is, at its core, a point-and-click, but it frequently interweaves brain teaser mini-games into its point-and-click progression, which for some might be a welcome challenge — for others, a painful obstacle to an otherwise simplistic indie. In The Office Quest, you play as a rather overweight gentleman working in a nondescript office. He, along with his fellow co-workers, sports a monstrous onesie that may or may not imply certain things about his character. While working one day, he spots a glowing red floatie in the air, and decides to give it chase. Unbeknownst to him, this pursuit would lead him on a merry adventure not only through his own workspace but into a bizarre beyond, of which we won’t discuss for the purpose of avoiding spoilers. As you traverse your unnamed hero’s office building, you’ll be tasked with an array of classic point-and-click scenarios. Your best course of action is to simply click… everything. And click everything five times, too, just to be sure. You’re able to pick up items, but they won’t activate until you’ve clicked the appropriate trigger, and if you click something else instead, your character is liable to raise his hands and shrug at you with a staggering amount of nonchalance. 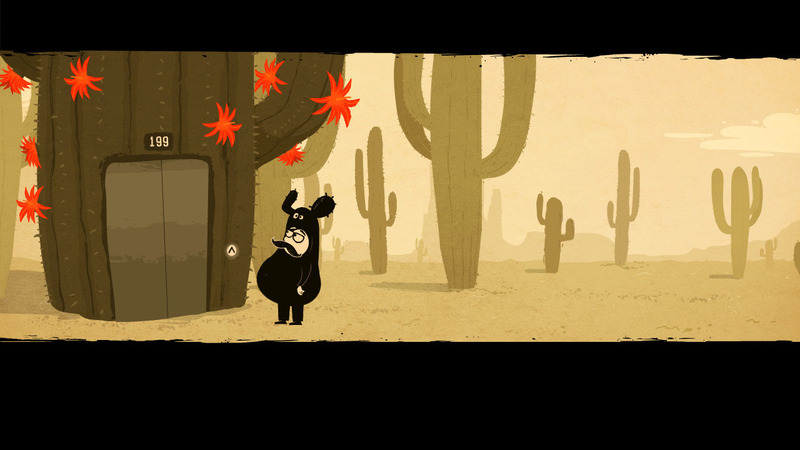 This point-and-click indie’s strengths are founded on its unusual art, its wry humor, and its clever sound design. The art is cartoonish, but feeds directly into the humor, depicting stereotypical characters like the office boss in hilarious and biting ways. The sound design, on the other hand, keeps the lack of voice acting from being missed, and provides excellent support for the very strange things often happening on-screen. And what’s often happening on-screen? More often than not, absurd chaos. If you didn’t take the animal onesies as a hint, you’ll quickly discover anyway that The Office Quest has no interest in keeping away from the strange and the inane. The path to your undefined glowing goal is not always clear, simply because what you’re supposed to do to progress is completely ridiculous. While the gameplay is rooted in the standard point-and-click structure, scattered throughout The Office Quest are mini-games which you must play to proceed. Unfortunately, these mini-games are not always well spelled out, and sometimes are so geared for a particular type of mind that the casual player will struggle with just moving forward. If you don’t like math or geometry, you may find yourself completely frozen in certain sections of The Office Quest, despite it being an adventure point-and-click. For some, these extra puzzles may be extra fun, but for those who are in it for the wry laughs and the intriguing art, they can be halting to the point of severe frustration. For an indie that snickers at work culture, forcing its players to work through its often un-fun puzzles is awkwardly ironic, and perhaps would only be funny if it was meant as a joke within a joke. If the art was consistently enthralling, it would be easier to forgive the plethora of eccentric puzzles, but even this, too, is inconsistent in its complexity and creativity. The Office Quest relies heavily on mini-games that won’t appeal to all, and instead of rewarding irritated players with relatively straightforward point-and-click solutions, offers inane answers to mystifying puzzles instead. Regardless, The Office Quest is commendable in its chokehold on office culture, and will often draw laughs from players with any level of experience with cubicle life. It’s a wickedly dry and funny entry from 11Sheep, and stands as a testament to how satire can drive a title rather than ruin it. While The Office Quest’s absurdity is the powerhouse of its hilarity, it’s also the stumbling block that causes its overall gameplay to be bizarrely difficult and often bewildering. Its clever satire drives you through its myriad of point-and-click puzzles, but some of the more unexpected brain teasers may have casual players perplexed and scratching their heads for far too long.